Picture: Peter Gray shown here at right, 3rd from the top. His funeral is this Saturday in Newcastle NSW. Easter weekend just past. The editor of SAM met Peter once at the pictured Marrickville Town Hall meeting over a coal mine at Anvil Hill on 24 June 2007. Thank you all for the outpouring of warmth and the tributes to Pete that you have made in the last two days. Stay together and keep sending the love around. Naomi and Pete’s family and all of us hope that you can come to Pete’s funeral service and celebration of his life on Saturday 7 May, at 11am. There will be a burial ceremony at Morpeth Cemetery (Butchers Lane, Morpeth -- for those not from Newcastle, Morpeth is more than half an hour away from the Catheral) after the conclusion of the funeral service, starting at 1:30pm. There will be a wake at the Croatian Bowling Club, on Alfred Street, Wickham (in Newcastle). The Bowling Club will be open to us from 3pm and there will be food for all. At 4pm, at the Croatian Club, there will be a presentation of photos and story-telling for all to participate in. You are all welcome to attend all or any of these ceremonies to say goodbye to Pete. In lieu of flowers, Pete asked that people coming to his funeral make a donation to the Mount Oak Community. There will be details of how to do this available on Saturday. If you have any digital images of Pete that you would like us to include in a slide-show on Saturday, please send them by Thursday so we can include them. "Against the propaganda of terror and the propaganda of luxury, have you a nice simple answer?" Ezra Pound, 1962. A big thank you to Tony and Lisa and South East Forest Rescue supporters for a fab 3 days at Badja Fest next to the magic talking creek, and the awesome and sad tour of logging compartment, pic to follow. Good to meet Trevor also. Even Cooma seemed nicer than I remember. The frolic in the twobie 3/4 up (!) Big Badja was nervy, retreating with tail between legs. The side trip to the Tuross River (?) Cascades was super, as was the rush down to Nalbaugh SF on Monday night and Tues, omitted from the Coolangubra Wilderness complex of the SEF National Park. The report for the latter is: Despite a day of tramping, discovery of what I think was the missing Koala Fire Trail from 1:25K topographic map, on the north side of compt 1402 (renamed south end of "Waratah Rd" now?) and approaches from south side of 1402 from Mines Rd , it appears the historical blockade site in 1992 has gone, gone, gone. A pity. It was my initiation in 1992 into the green movement with a clan called "Green Gliders" - amalgam of Canberra and Sydney folks. One of those Matt from Sydney WAG committed suicide 10 years ago due to mental health issues, but he helped save the forest nearby in SEF NP from my view. Others still kicking as far as I know are Fatty Thompson, Jarrah Keenan, Rich Gregory, his mate the vet (first name) Cameron, Zac, the two OShannaseys. In what I think was 1402 off Mines Rd to the north, I did find a 10m girth big boy E fastigata brown barrel in the logged area, with pic to follow. Also 4 creek crossings with erosion guards and blue metal rocks. There is a story of pollution breach in there methinks. The south side of Mines Rd is a monument to vandalism and defacto plantation establishment. On the north side of 1402 from KFT aka 'Waratah' I got more pictures of big boys 11m and 8m girth and walk in hollows on living 400 yr + beauties. The forest here is intact and gorgeous and tonic to the soul. Not a bad day now I am back in city concrete. Thanks SEFR for getting me out there again. I haven't forgotten the NRMA thing. Source of map and bar graph below: Tony Whan and South East Forest Rescue. 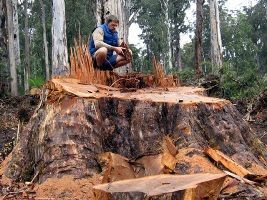 Minister MacDonald to kill redgum forests of the Murray River, NSW? The River Red Gum National Parks are under threat. A final decision on Red Gum Parks is likely this week but there is a strong chance it will not be a good one. The Minister for forestry, Ian MacDonald, has said he does not agree with the recommendations of the Natural Resources Commission and he is doing everything he can to bring them down. 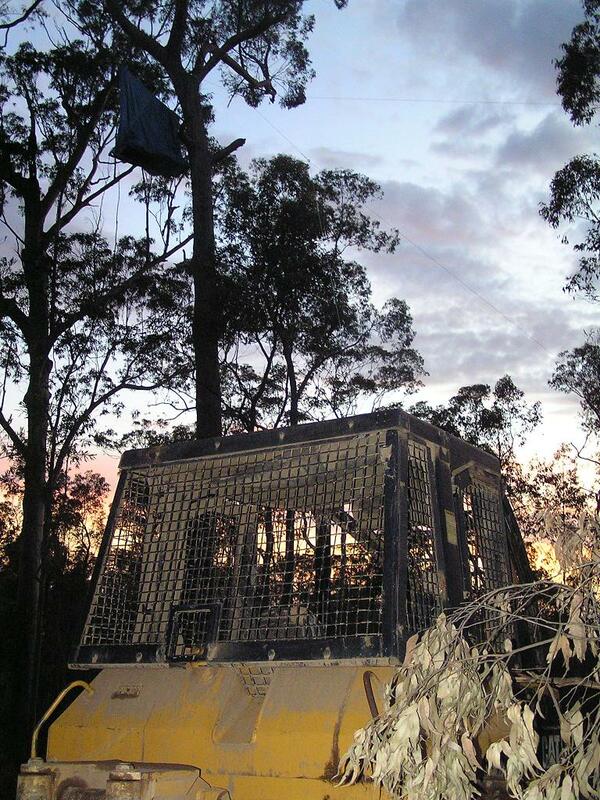 In the mean time, forestry are trying to open up new areas for logging in the Millewa forest. Please make a phone call today in a last ditch effort to save the Red Gum. They need to deliver on the promises which they made last year. The full reserve areas recommended by the Natural Resources Commission need to be protected. 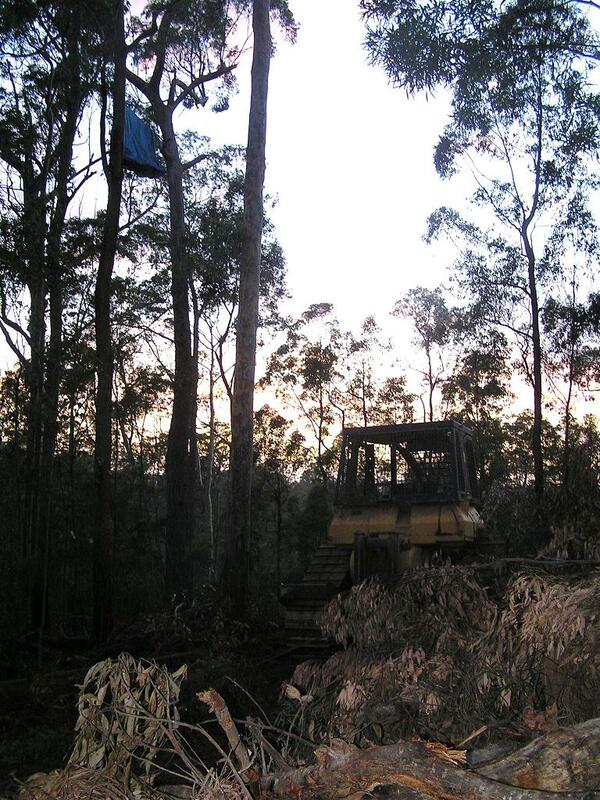 Logging has to stop in the Millewa forest. save the waterfall and the Gully's unique Indigenous history. nestled between the far more well-groomed Bondi and Bronte beaches. to be restored and returned to public hands. sit forty metres above the ground. surveys failed to identify these animals as being present in the area. submission of a mere five per cent cut of 2000 emission levels by 2020.
limit it's GHGs is by ending native forest logging. told time and again that this is sustainable." the right decisions are made. us and our children's future." For more info please ring Lisa or Tony on 0428 640 271. 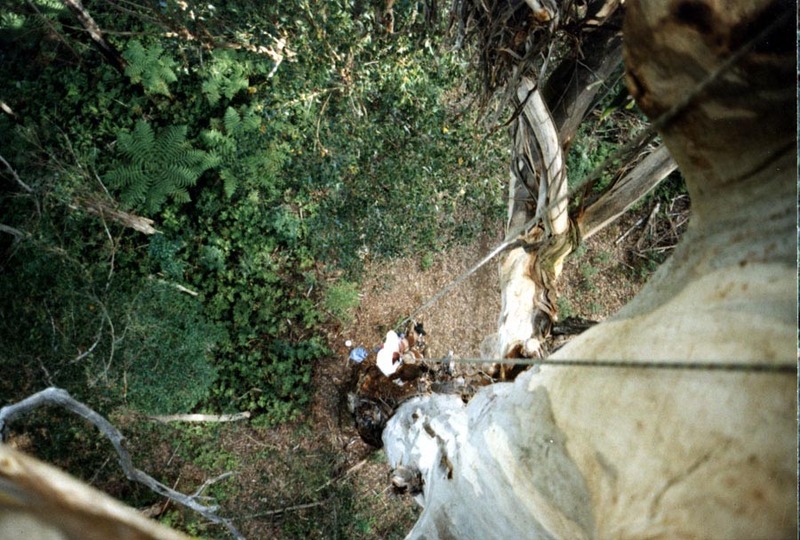 Peter Spencer is famously gathering momentum behind his aerial hunger strike against land clearing laws in New South Wales. We notice Michael Duffy has rushed into print in the Sydney Morning Herald today too. We will have to read him closely to find fact from fiction. 1. Is his land crown leasehold? If it is then like all leases there are terms and conditions. There is no general unfettered right to develop and/or clear crown leasehold land. If it is free hold that doesn't mean that is the case in much of the rest of NSW which has always had a long history of crown leasehold subject to many government obligations. Check the land tenure before generalising about rights to clear vegetation and sterilising private property. 2. If Senator Joyce is so sure a property right has been resumed and should be 'financially paid for or returned', does he apply the same standard to Govt benefits like drought assistance and flood emergency assistance? Or remote area taxation benefits? Should these payments be returned in times of profit down the track? Joyce can't have it both ways - privatise the property rights but socialise the government subsidies in times of disaster. 3. Have the protesters in general with placards calling for freedom and liberty from government interventions on the environment willing to give up all the other social benefits of government support, when complaining about the costs? If Mr Spencer, or Senator Joyce want to secede from the Australian Constitution which provides for the welfare, order and good government of the place with all the benefits and costs involved maybe they are living in the wrong country? Jesus as feral lock on anti woodchip protester? 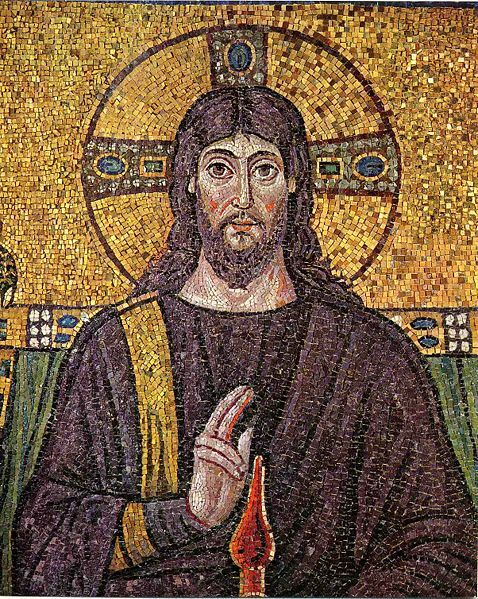 Image via Wikidepdia: 6th-century mosaic of Jesus at Basilica of Sant'Apollinare Nuovo in Ravenna. Though depictions of Jesus are culturally important, no undisputed record of what Jesus looked like is known to exist. A bit of blog prose on this Christmas 2009. Funny how George Pell is Cardinal for Australian Catholicism who also rejects his own Pope's belief in climate change action (eg solar panels on the Vatican). So what side would Jesus be on when it comes to forests? Well as a non church goer ex altar boy, number 8 of 9 Catholic family we believe Jesus would hate woodchipping of forests. We reckon He would scorn Family First and the Assembly of God mob there in Orbost, so called 'Timber Town' given the huge woodchipping rates. It's presumptuous but we think He would glory in the 10,000 year old steady state wet old growth forest systems in East Gippsland. The furries, and crawlies, the lichens and fungi. The constant humidity and bushfire resistant soggy topsoil: The kind that Yoeman and now Andrews want to replicate in agricultural water retention systems. True Jesus came from a blue collar tradie family of carpenters. But woodchips are not timber. And selective targeting of high volume old trees in wet forests is not stewardship. He would be fretting over the butts and crowns on the forest floor, all that wood, with the stems off to Eden's chipmill. We reckon with climate so threatening Jesus would be a lock on protester under a bulldozer and the Brumby and Keneally Governments would be auditioning for Frank Thring's job as Pontius Pilate. Jesus would even look like a feral with beard and long hair, refusing materialistic pretensions, getting brained by an enraged unionist with an axe handle. Here are detailed figures from our truck count on Wednesday. The total for the day was 121, compared to 98 in Feb 09 and 191 in Sept 08. The numbers have certainly picked up since the start of the year, but one interesting thing: thinnings have almost halved, from 39% of loads in February to 20% this week. This suggests to me that the thing that is keeping them (SEFE [Eden Chipmill) going is their cheapness. The other side of this is the fact that the contractors claim they are not making money from thinnings and there may be tensions over impending royalty rises. Thinnings are E1s. They are desirable and while more expensive, (even though the royalty is lower to reflect the greater difficulty of extraction) we would normally expect them to be more saleable. Apparently not in the present circumstances. We can't say we have reviewed this book by the author pictured above, and maybe there will be issues to debate, but the notion of a sustainable event framework in itself is excellent. All that waste! It's terrible and embarrassing at so many Sydney events and suggests serious stupidity. It's published by UNSW which is encouraging. 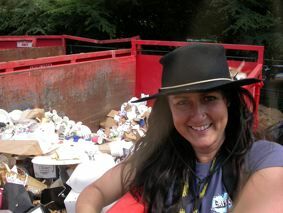 Newcastle’s Meegan Jones returns to Australia after working for the past three years in the UK as Sustainability Manager for the producer of Glastonbury, Reading & Leeds Festivals, Festival Republic, to launch her first book - a comprehensive guide on Sustainable Event Management. Meegan has spent the past 20 years working in events, focusing in recent years on developing sustainability in event management. She has developed sustainability solutions at Peats Ridge Festival in Australia and worked on sustainability issues for Live Earth India and the London Marathon. Meegan is currently the global greening consultant for the next round of Live Earth events, is the events consultant for UK-based music industry climate impact organization Julie’s Bicycle and is on the working group for Global Reporting Initiative’s (GRI) events industry sector supplement. Meegan is also working with the United Nations Environment Program (UNEP) on their new Music and Environment Initiative, to be launched in 2010. In Australia until end of January 2010, Meegan will then take up new events and sustainability challenges in India. Meegan Jones is an events professional focusing her work on developing sustainable management solutions for live events. Apart from producing practical solutions to sustainability challenges, working with industry peers she has researched and developed benchmarking and systems for assessing the impact of events. She uses her experience in marketing and event management across the retail, music and media industries to create scenarios which engage and activate the audience, performers, crew and the supply chain. “Finally, a book that gathers all the knowledge about running a sustainable event and presents it in one easy to understand, well thought out format. Possibly one of the most important books written on event management this decade, a must have for organisers of events everywhere"
In that case it would be an "aust govt" topic really. But this story is about "the trees" in the jargon, which itself is a misnomer because that's shorthand for the massive water storage in the root system, the fungi and lichens, vertebrate furries, invertebrate crawlies, ground and mid storey plants of various green hues under 800 year old huge tree trunks and cool canopy. Places like Goolengook, Dingo Creek, Brown Mountain, some seriously vandalised and smashed, others partly so, and a rare few still intact, not yet woodchipped for Japanese cartoon books and landfill. Subject: 45000ha new National park in East Gippsland! Pop the champagne and shout it from the rooftops; The Parks And Crown Land Legislation Amendment (East Gippsland) Bill was been passed by the Victorian Parliament’s Legislative Assembly yesterday, 26th November. This means that 45,000ha of forest including the entire Goolengook forest block, Rainforest Sites of National Significance including Dingo Creek and Sassafras Basin, and linkages between parks are now protected from logging. This means that most of the areas which fulfilled the ‘JANIS’ criteria during the 1996 ‘Comprehensive Regional Assessment’ have at long last been included in the “Comprehensive Adequate and Representative Reserve System,” – which is what the public were lead to believe at the time. And it only took a campaign involving dozens of lobbyists, hundreds of blockades, thousands of protesters, millions of items of correspondence and inestimable stress on all involved. The passing of the The Parks And Crown Land Legislation Amendment (East Gippsland) Bill is a wonderful and amazing thing. It gives hope that there is some decency in humanity, and hope that honourable deeds will occur. here's my take on the announcement. .....The areas that were included (after some were gutted like the heart of Goolengook and Dingo Creek) are a good save, but look at what was left out and double saved - ie - protecting large areas that were already in protection zones while leaving areas like the controversial Brown Mountain old growth open for the loggers. Old growth forests to go up in smoke. The Brumby government snuck out a media release at 7pm on Tuesday 10th November 2009. What was in it that they didn't want the media to make a big deal about? It was about the area of old growth that it had promised to protect 3 years ago - but much reduced. There is now 5,000 ha less than the original offer. It also cut out the intact stands of old growth at Ferntree Creek and Big River. How did they do this and still claim to protect even more? They protected areas that were already protected but under a different name. In 2006 they had 4,000 ha of protected forest offered for protection. In 2009, the government used this trick again to protect an even greater 12,000 ha of reserves. This is hardly a conservation win when ancient trees at Brown Mt. are still planned for logging. The dry crappy burnt forest around Buchan has been left in as 'significant stands of old growth'. However - one part of the offer is quite good. There's a decent area of the Yalmy forests protected (too steep to log) and at last Goolengook (what a shame they’d already spent over a $million logging the heart out of it earlier). Page ONE of the ALP 2006 election policy was a clearly worded promise to protect "the last significant stands of old growth currently available for logging" --- not cow paddocks --- not burnt regrowth --- not previously logged areas --- not protect areas already protected - but 'significant stands of old growth currently available for logging'. This is another attempt by the government to put polish on a turd. Mr Brumby has caved into the logging brotherhood - again. Three years of negotiations after a solid promise to protect old growth and the Labor government still can't do what it says it will for forests. So that means thousands of hectares of publicly owned old growth forest are still on the government logging maps for conversion to industrial tree farms. The government could have easily and smoothly honoured this promise - saved old growth forests - our 600 year old trees, endangered wildlife and saved the declining logging industry in East Gippsland. How? By helping to provide skilled workers to the plantations in the rest of the state. These plantation companies are screaming out for hundreds of workers. But Mr Brumby has instead decided to knock down ancient forests, add hundreds of years of stored carbon into the atmosphere, convert public forests into commercial tree crops, maintain the conflict, keep a handful of workers in an insecure industry, while allowing the plantation logging companies in the west to import their labour needs.